Talk about procrastination and distraction! My trip was a year ago and I am only now getting to finalizing my drafts. Phew! I promised others I would post about my trip so I apologize for the delay. I traveled over 8,000 miles and saw two sunrises during my flights to Bangkok. My layover in Hong Kong didn’t show much of the city since it was so foggy, but the airport was pretty snazzy and were plenty of English speaking staff on hand to help. Upon takeoff, the terrain around me looked just like a Chinese landscape painting – the clouds were caught in tall, pointed peaks , and even though it was overcast, the view was fantastic. 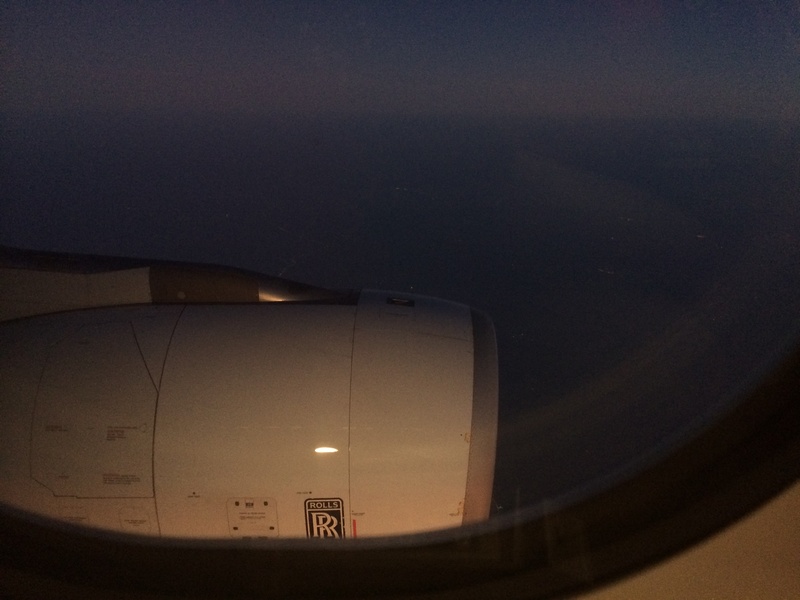 I travelled to Bangkok in Rolls Royce style courtesy of Cathay Pacific. When I landed, it was early evening. I was met at the airport and it’s a good thing, as I would have been lost. Due to the Shutdown Bangkok movement, roads were closed so cabs couldn’t take us to our hotel. 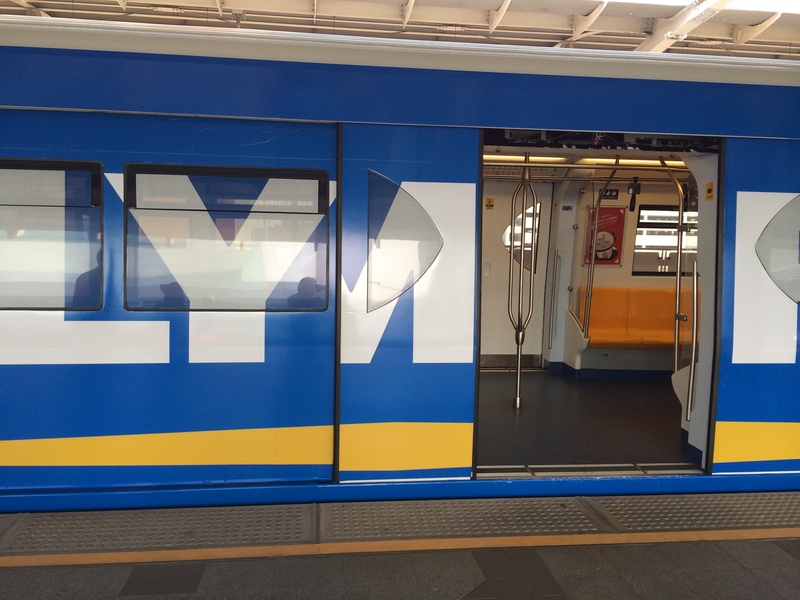 I hit the money exchange, we figured out the BTS Sky Train, and took it as close as we could to our hotel. 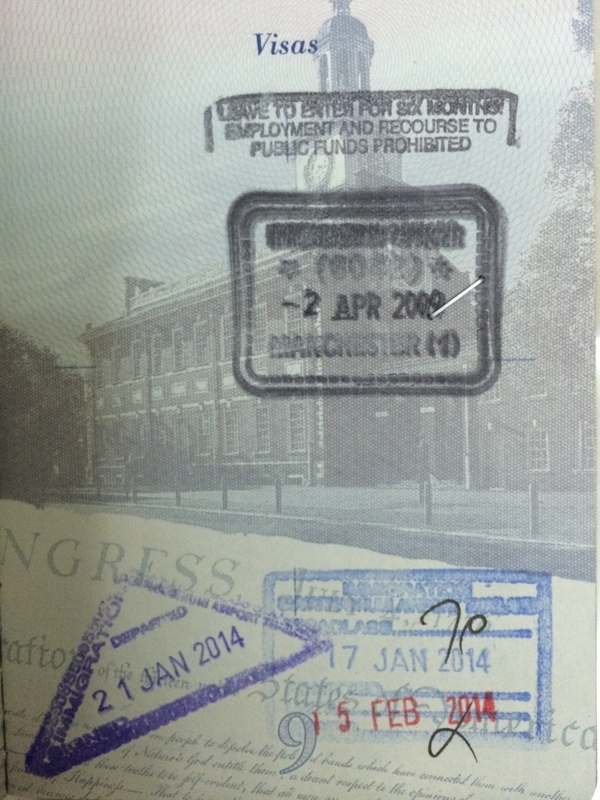 The BTS is clean and announces every stop in English, so it was very easy to use. I easily humped my awesome Zuca luggage with me all way to the hotel over roads, uneven sidewalks, curbs, stairs, and potholes. Luckily the temperature was nice. In fact, the weather was mild and cool my the entire stay and there was no rain to spoil any plans; it was perfect. 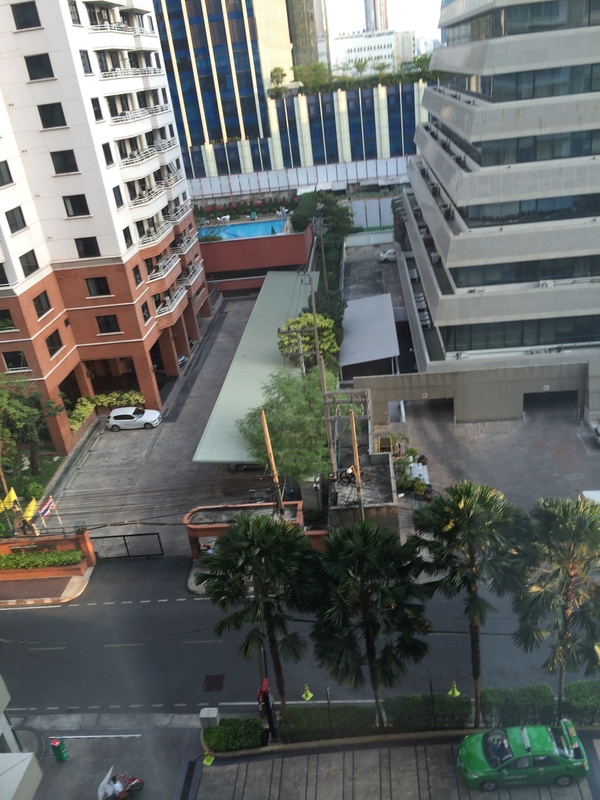 The view from my room at the Courtyard by Marriott, Bangkok. On my first full day in Bangkok, we visited two areas I was eager to see: Pahurat textile market (AKA Little India) and Pantip Plaza. We took a cab to Paharut because I really wanted to experience Little India and was on a quest to find an affordable saree. Fabrics, clothing and fashion are not really an interest of mine, but it was nonetheless amazing to view all the colours and patterns available. Had I been staying longer, I could have anything I wanted tailor made for a reasonable price. There were many beautiful sarees, but the hunt was on for something ready made and simple. 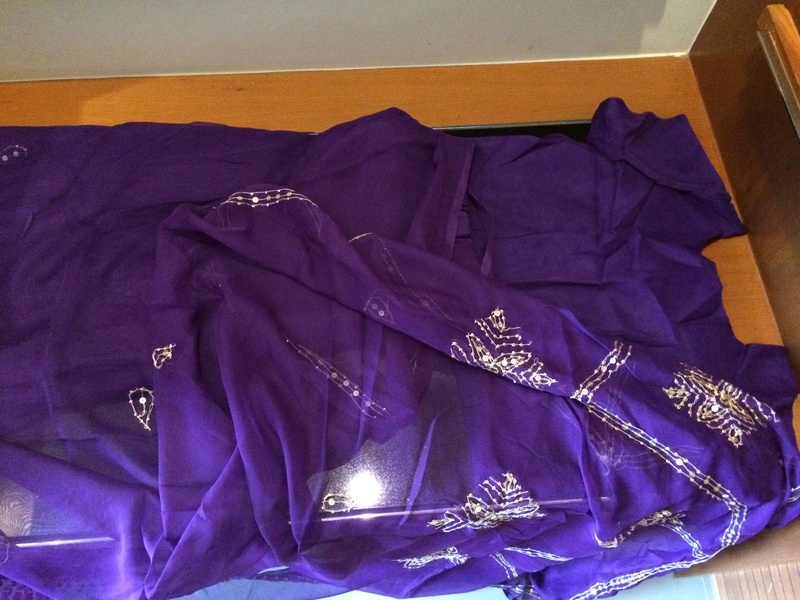 I am now the proud owner of a purple saree that I cannot wrap. Yeah, yeah it’s easy and ready made, but I’m still challenged with it. Maybe I just can’t pull off this much purple. At any rate I need a safety pin to keep the pallu in place before I can go out in it. I am now the proud owner of a purple saree. 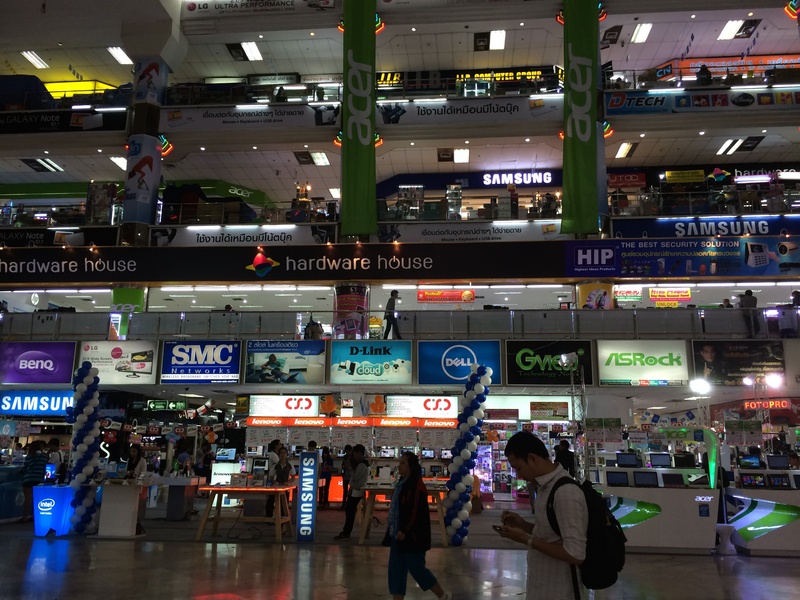 My next destination was Pantip Plaza, 5 stories of computers, components, games, camera, mobiles, accessories, and other tech! 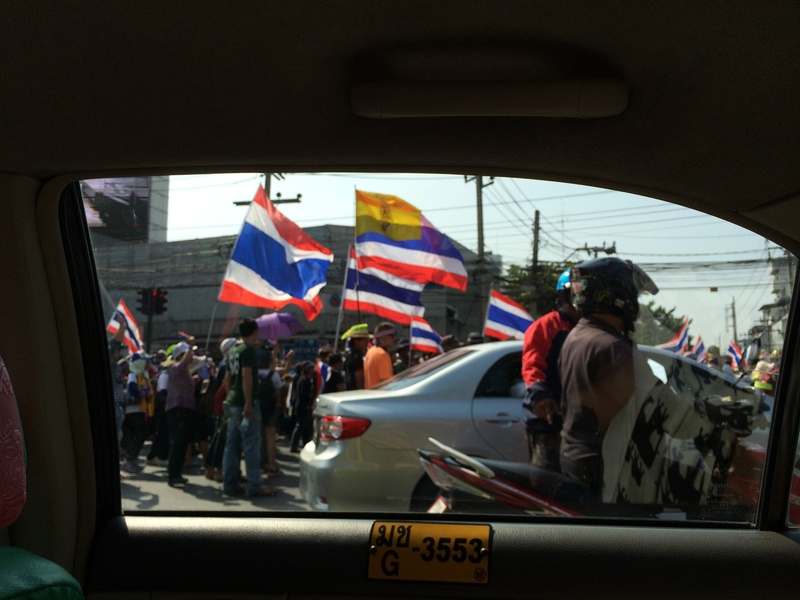 We successfully took a cab, all the while being weaved around by surrounding tuk tuks, mopeds, other aggressive taxis, and protesters. The traffic was wild and the driver even gave us a few scares, but it works in Bangkok, as I never saw any of the near misses make contact. Protesters blocked the road and we were at a standstill in the taxi for about 45 minutes. Now this was the kind of mall I could learn to love! I eagerly dove into the mild chaos looking for bargains and interesting gadgets. The selection was phenomenal, the prices were reasonable, and my companion Steph was able to bargain every vendor down even further with her amazing skills. I saw keyboards with Thai overlay, a suction cup sort of joystick for the ipad, and tons of parts, wires, and accessories for about anything I could want. Pantip Plaza is a mall with 5 stories of tech! 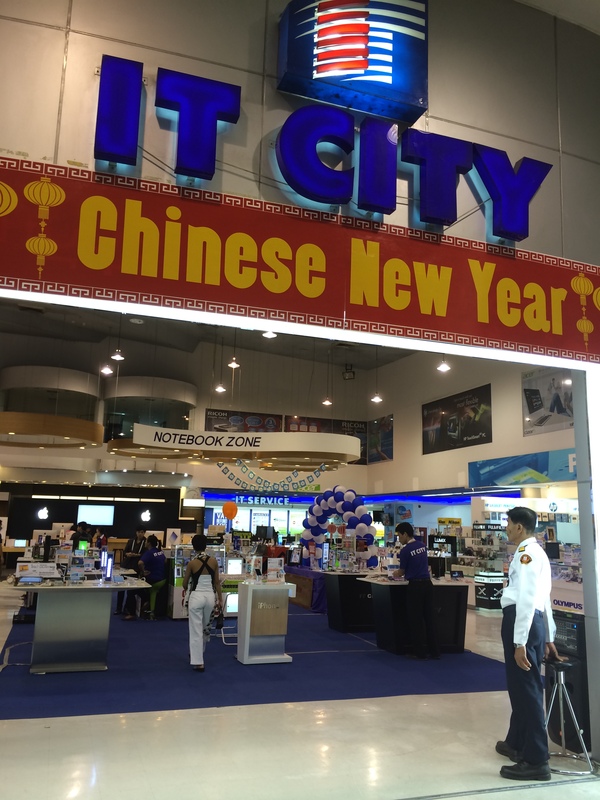 IT City was the single largest store in Pantip Plaza, taking up the entire 5th floor. 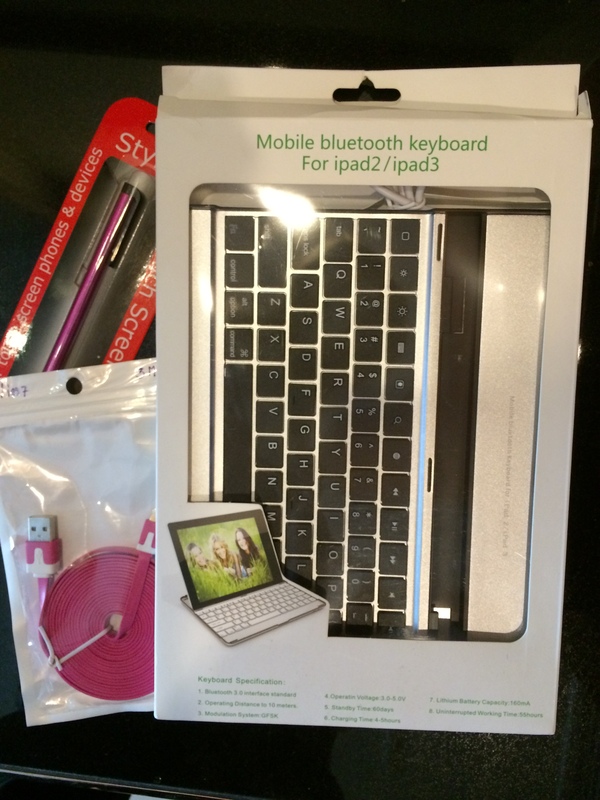 I purchased a 6 foot long lightning cord, a stylus, and a blue tooth keyboard that turns my tablet into a little notebook for 900 baht (about 30 CAD). What a deal! In fact, I used that very keyboard to write about all my adventures in South East Asia. 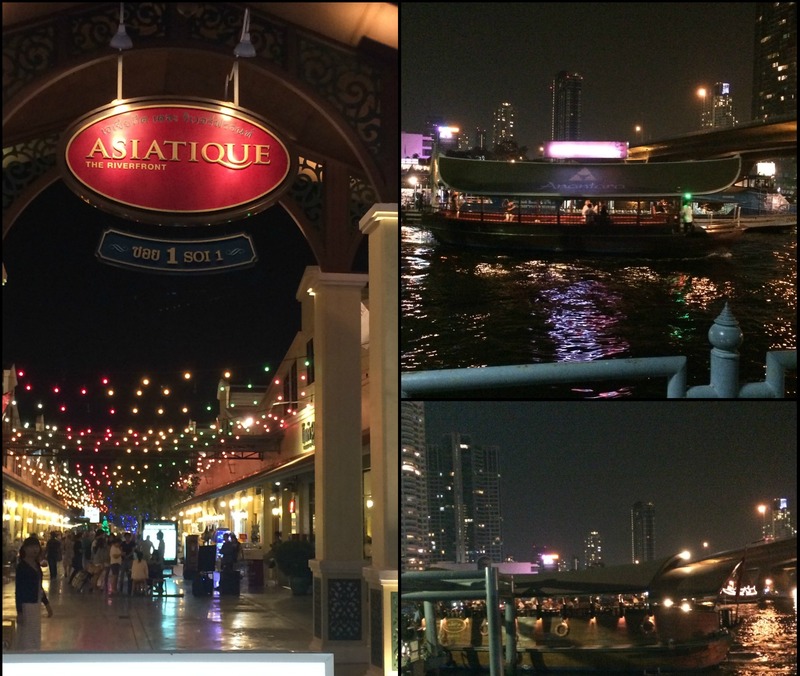 I wanted to visit one of the famed Bangkok night markets and the concierge recommended the new night market, Asiatique. We took the sky train to Saphan Taksin station, then walked to the piers on the Chao Phraya river. We took a ferry boat ride down the river to the night market where the scene was much more relaxing and than the other shopping experiences we’d had. There were no pushy vendors, just shopkeepers. Upon approach, the river reflected the lights of high rise hotels, restaurants, and a well lit, 60 meter high Ferris wheel over looking the waterfront. After we disembarked, the river side was full of artisan items, jewelry, restaurants, bars, souvenirs, and was family friendly. Every thing was festive and decked out in white lights. It actually reminded me a lot of being at Downtown Disney. We didn’t stay too late since we had to fly the next day, but I’m glad we experienced it or we would have missed the river and some of the spectacle. There was a gentleman manning a high end jewelry shop and since Thailand is famous for star sapphires, I was browsing. The store was out of my price range, but he was very friendly and told me how to easily repair a the catch on a pair of my earrings. I used the app Easy Writer to write this blog while on the road using my iPad. The app is clean and has a simple interface, with additional options you can bring up with a single gesture. So far it’s been just the right amount of word processing that I need. I used the free lite version, but the paid version has options for font manipulation such as bolding and highlighting and lets you create a PDF or email your document directly from the app. I took all photos for this post with my iPhone 5s. Please forgive my limited point and click experience. Stay tuned for more posts about my trip.